The oldest and the most popular place of worship in England, the Canterbury Cathedral is the Mother Church of the worldwide Anglican Communion and seat of the Archbishop of Canterbury. A World Heritage Site, the Cathedral’s history goes back to 597AD when St Augustine was sent as a missionary by Pope Gregory the Great. Having a tragic past, in the year 1170, Archbishop Thomas Becket was murdered in the Cathedral and ever since, the Cathedral has attracted many pilgrims. A must visit on your Canterbury trip, the Cathedral is a marvellous piece of architecture. Monday to Saturday: Seasonal timings apply. During summers: The Cathedral is open till 5.30 p.m.
During winters:The Cathedral is open till 5 p.m.
Monday to Friday: 10.30 a.m., 12 p.m. and 2 p.m.
Saturday: 10.30 a.m., 12 p.m. and 1 p.m. Bus stop opposite Magistrates Court. Bus stop adjacent to Magistrates Court. 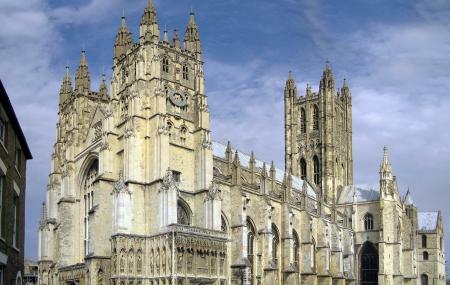 How popular is Canterbury Cathedral? People normally club together Dane John Gardens and Canterbury Glass Art while planning their visit to Canterbury Cathedral.